Most roses have to be pruned to keep them in condition and to flower as they should. 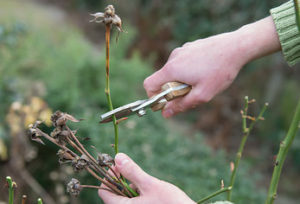 Actually, pruning roses is a lot simpler than most people think. For one thing, you don’t have to be overly careful since roses are tough plants. The second half of March is the best time to prune since you will then avoid frost damage. If the branches have already produced new shoots and leaves, it might seem a shame to trim them away but doing so will cause no harm at all. Be sure to use clean sharp tools. Always remove any dead or damaged branches. Also remove any branches growing at odd angles or ones that might rub against each other. The pruning method will also depend on the group of roses to which your variety belongs. Large-flowered roses and cluster-flowered roses (Floribundas and Polyanthas) have to be pruned every year. The rule here is: ‘prune branches above ground level back to 1 centimetre above the third outward-facing bud.’ An outward-facing bud is a bud located on the side of the branch and usually has a stripe on its underside. These buds are dormant buds that will produce leaves after pruning. Because these buds are located on the sides of branches, the new branch that emerges will grow properly to the side as well. The third outward-facing bud is usually located between 5 and 7 centimetres above the ground. You could make it a lot easier for yourself by pruning all the branches to this height. To reward you for your efforts, your rose will produce beautiful strong new branches that will bloom profusely. 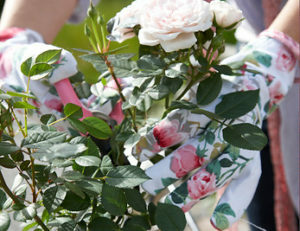 Miniature roses can be pruned to between 7 and 10 cm above the ground. 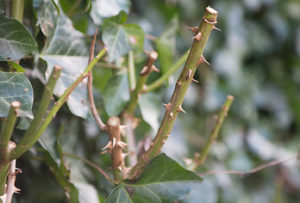 If you don’t prune the shrub roses in this group, their branches will become longer and longer but with fewer flowers: not exactly what you had in mind. Actually, you don’t really have to prune species roses. If you think your rose has become too large, however, you could limit is growth by pruning its branches back. Just remember that most of these roses flower on second-year wood, so, unless you prune after flowering (summer pruning), you will have to wait a year to see these branches produce flowers. Shrub roses don’t necessarily have to be pruned every year. These plants will continue to flower nicely even if this is done every two or three years. Going a year without pruning will also mean bushier plants that provide better ground coverage. The rule for shrub roses is: ‘prune back to 5 – 7 centimetres above the ground every 2 or 3 years’. This is also accomplished in public green spaces by using machinery, so you don’t have to worry about being very careful. Prune climbing roses as little as possible, being sure to simply let them grow for the first two years. Remember that pruning this kind of rose in spring will mean removing many flower buds. With this in mind, wait to prune your climbing rose until it becomes too large or old. You can see when a climbing rose has become so old that it needs pruning when only its upper branches produce flowers or when it has many dead branches. That’s the time to rejuvenate it. Important: pruning overly large climbing roses just a little won’t do much to rejuvenate it. Instead, take a really rigorous approach because this rose will produce strong new growth from each point at which you have pruned it back. You should prune the main branches on overly large or old roses back hard during the second half of March. Then rearrange the main branches over the wall or pergola and make sure they are properly supported. If needed, prune away any excess large branches back to just above ground level. This will produce new branches that will flower nearer the bottom of the plant. Although flowering will be somewhat sparser than usual the first year following such a rigorous pruning, you will be richly rewarded the year thereafter. Ramblers shouldn’t be pruned at all; they flower on second-year wood. If pruned, all you would be left with are long branches without any flowers. The pruning of a standard rose depends on the variety grafted onto the rootstock, so refer to that variety’s group to see how to prune it. You might also have to trim some branches growing inwardly in the centre of the sphere. This will improve air flow and ensure that enough light reaches the leaves inside the sphere. A grafted rose consists of a species rose (the rootstock) and a cultivated rose: the cultivar grafted above it that forms the shrub or, in the case of a standard rose, the trunk and sphere. Sometimes, however, the rootstock produces suckers. If this happens, you should remove them. These suckers are easy to identify since their shoots don’t emerge from the grafting point (the bulge located above the roots) or above it but from beneath it (from the rootstock). Break off or cut away these suckers close to the root. 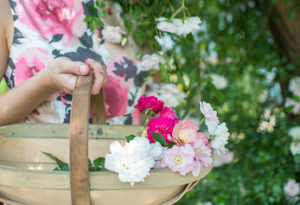 You can encourage more flowering by removing faded flowers: deadheading. A rose flowers to produce seeds; if you remove these faded flowers, the plant will no longer have to invest its energy in producing rosehips. If you don’t deadhead, the plant will still continue to bloom but not as profusely. By deadheading, you will be rewarded with an even more luxuriant flowering display. Once autumn arrives, however, you can forget about removing faded flowers. This way, you will often get a nice bonus: pretty rosehips you can enjoy for weeks to come. 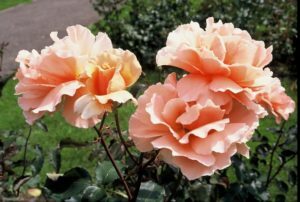 Roses are vigorous growers and will need to receive enough nutrients during their growing season. Give them a regular supply of fertiliser: the first application at the end of March, the second in June (before the first flowering) and the third and last one in mid-July. Work the fertiliser into the upper layer of soil around the rose. Organic fertilisers are best since their minerals are released gradually and will have an effect lasting around 6 to 8 weeks. If the plant requires extra nutrients quickly, a nonorganic fertiliser could be applied. The nutrients in this kind of fertiliser are immediately available to the plant so they work faster than an organic fertiliser. If you see leaves that turn light green to yellow with dark veins, the problem is probably a nutrient deficiency. You can buy fertiliser especially formulated for roses that contains high levels of potassium and nitrogen. Stop fertilising after mid-July so that your rose is strong and hardened off before winter begins. 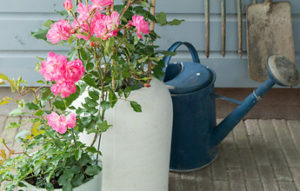 Give newly planted roses extra water for a while; don’t let these plants dry out completely. Once established, however, this extra watering is usually no longer necessary except during extended dry periods. A rose can send its roots deep into the soil in search of moisture. Water in the morning or afternoon, but preferably not in the evening. This is because roses should be dry by the time night falls in order to reduce the chance of fungal growth. This is also why it is best to water them from underneath instead of from above on their foliage.